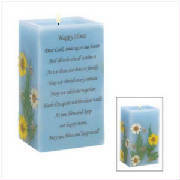 Drift away on a cloud of heavenly uplifting scents and let your thoughts and wishes fly free! Highly scented 7 oz. 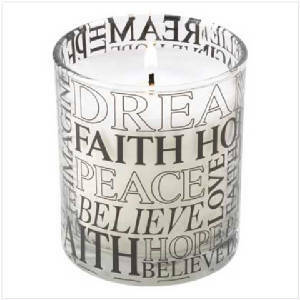 candle comes in a keepsake glass holder richly decorated with words of inspiration. A fantastic favorite for any dedicated dreamer! Burns up to 35 hrs. Delight your beloved sister with a poetic prayer created just for her! 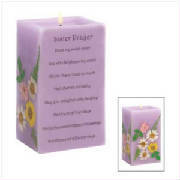 Wonderful pressed floral candle brings a sweet reminder of springtime to mind, a relaxing lavender scent bestows a heartwarming aura to the flickering flames golden glow. The face of this candle bears a sentimental verse which uplifts the spirit and gives a uniquely touching expression of everlasting love and faith! Paraffin wax. 3"x 2 3/8" x 5" high.